Hey everybody, welcome back! Hope you all enjoyed your long weekend if you live in a place such that this last weekend was a long one. Alternatively, I hope you enjoyed your regular-length weekend followed by your fairly typical Monday! My traffic dropped fairly precipitously over the weekend, so I’m guessing that means that most of you were indeed not around a computer. Either that, or you had very little confidence that I’d actually be posting anything. Or, most likely, both. The weather around here was crap this weekend, which cancelled my plans to go backpacking near Glacier Peak. I still hope to make it back to that trail, but this weekend wasn’t looking like the right time. Instead, Julie and I headed over to the desert, where the forecast (which was correct) said it would be 70 and sunny. I didn’t really realize it until this weekend, but holy crap! There’s some absolutely GORGEOUS terrain over there! I definitely need to get out there and explore it more. You can probably tell that today’s picture is absolutely not from the desert, and if that’s what you were thinking, you’re correct. I’m still following my rule that I won’t go through my new pics until at least a couple days since I’ve taken them. Which means, I’ll start looking through them tonight or tomorrow. This was taken at Mt. Baker Ski Area, which is in the northern part of Washington State. I’ve only skiied there once (the day I took this picture), although I have also snowshoed there, and I’ve been up there a whole bunch of times in the summer (it’s inside Heather Meadows Recreation Area). This was I believe on closing weekend a few years back, so mid to late April. Checking the timestamp on the image says yes, April 27. So, almost into May. Now you can see one of the things that frustrates me: why do they have to close these mountains so early?! They clearly still had plenty of snow. I suppose you could argue that by then, most folks have already hung their skis up for the season, so it becomes more and more difficult to keep running the lifts profitably, but whatever, I’m not concerned with the bottom line, I just want to ride a line to the bottom! Sigh, oh well. It’s worth noting as well that Mt. 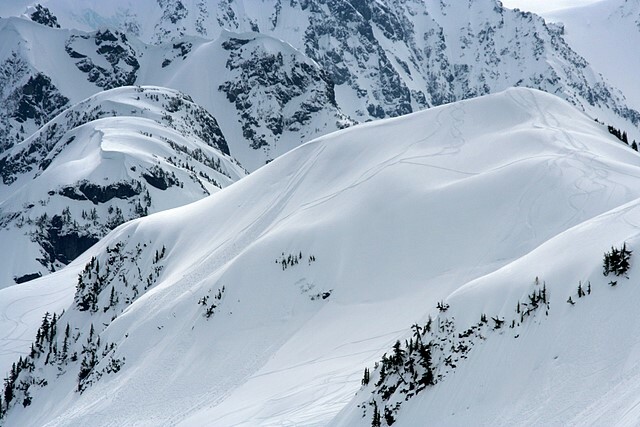 Baker Ski Area holds the world record for snowfall in a single season. I believe it’s not just the world record for ski areas, but for any point where snowfall is measured. That could be wrong, but I think it’s right. Anyway, the record was set in the 1998-1999 season, when they had 1,140 inches of snow fall. (That’s **95 FEET** of snow, or 29 meters!!) That was a La Nina year (you know, the opposite of El Nino). Oh, did I mention that La Nina is also scheduled to make an appearance this season? Yes. Yes it is. Excellent. I should also note that this picture was NOT from the record breaking season. This was just from a more typical season, where they average 647 inches. Still not too shabby, kinda makes you wonder why I’ve only skiied there once, huh? Oh, right, it’s more than a three hour drive. That would do it. Notes: Canon EOS Rebel XT, Tamron 28-300mm VC lens. 1/500s, f/11.0, ISO 100. Focal length: 109mm. crap weather or not the picture of the snow mountain is really nice. i think even 3 hours drive worth the visit for such a nice scene.